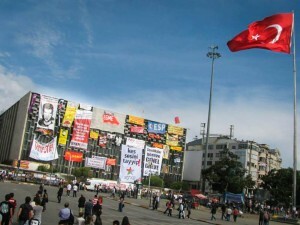 It is noon and I am making my way from Beşiktaş in direction Gezi Park, Taksim Square. No bus is operating; all access roads are still blocked with barricades, which protesters built up here in the past days. The barricades are transversely placed busses with stamped window, former barrier fences, waste containers, wooden pallets, road signs and cobblestones. 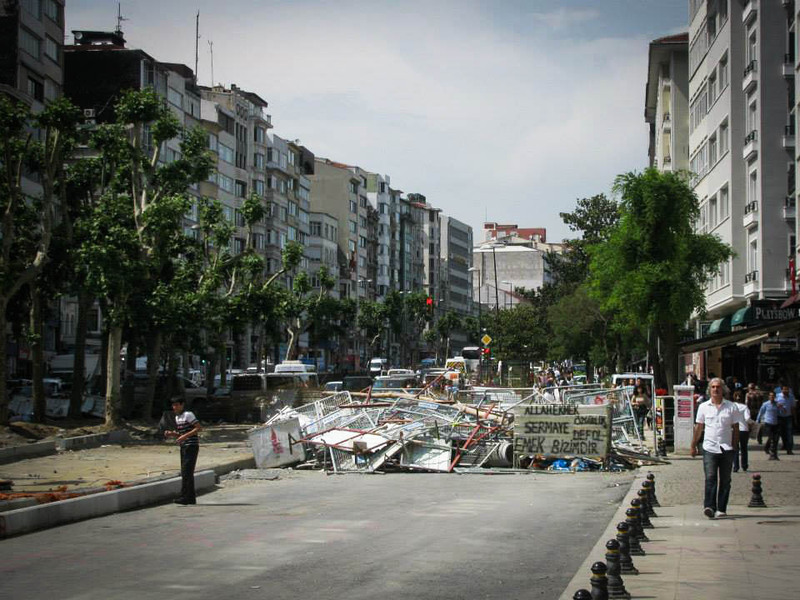 The centre of Taksim is a district of pedestrians now. 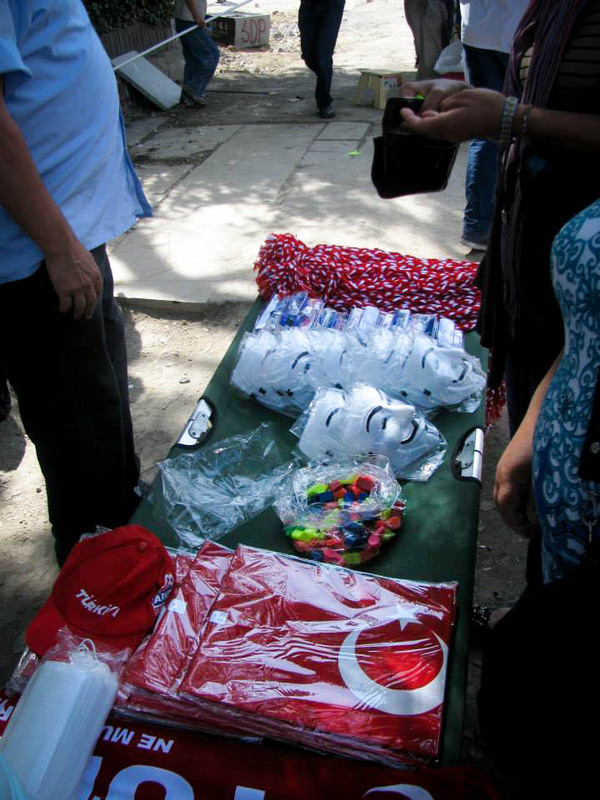 Street hawkers are waiting for clientele at the entrance of the park already, on offer: Turkey-flags, whistles, Guy-Fawkes-masks, diving goggles, headbands with Atatürk-themes. A big banner indicates arriving passengers, where they are: “Direnişimizin 9. günü” – the 9th day of resistance. Groups of people are sitting on unfolded newspapers and picnic blankets in between tents inside the park; a couple are reading, discussing, sleeping, making music, laughing, studying for exams. Some people are busy with their phones, the most important mean of communication between park and the rest of the world. Mostly young adults are seen during this time of the day, but also infants and seniors are finding their space inside the turmoil. After a few meters I am reaching a big tent, entitled “sivil insiyatif”, civil initiative. I descry tons of drinking water, medicine, bags full of food inside. People are arriving with new bags consistently; donations for the protests, which are assorted by volunteers with rubber gloves and distributed on stands all over the park. Anybody can stock up on whatever is currently needed. 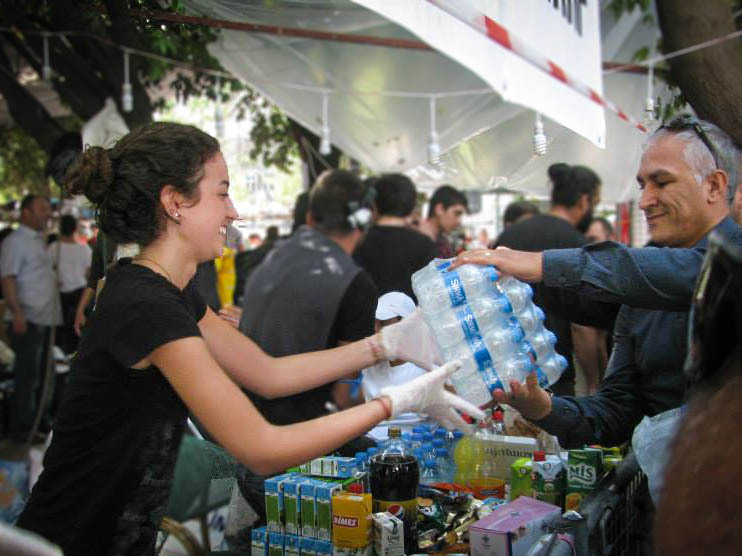 Citrus, bottles of vinegar and dilutions against gastric disorders are being prepared, to take care of the eyes of tear gas attacks victims. 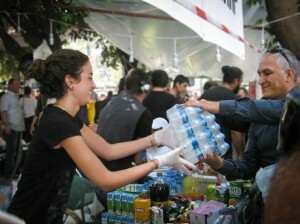 A pebbly wall offers supply goods for everyone in the centre of the park, a banner above: “Tayyip istifa” – Resignation Tayyip. Even a box with socks of every size is waiting for cold feet. Some trees are decorated with colourful fabric scraps, every piece of fabric stands for a wish of a person, who tied the fabric on the tree. Binding wishes on trees is a popular custom from Balkan to Central Asia. Garbage bags on every corner are making sure that the park stays clean. Animal food is displayed, so that even dogs and cats are feeling welcomed. There are poster reminders of Abdullah Cömet, who lost his life during the protests. Next to it are maps of the park, where a supply centre, toilets and first-aid-tents are marked. Banner of the “Anti-capitalist Muslims” are attached next to pictures of Anonymous and quotes of John Lennon, aside the rainbow flag of the LGBTI-group. It seems like also those, who are normally marginalised groups of society, are finding their space inside the centre of action. 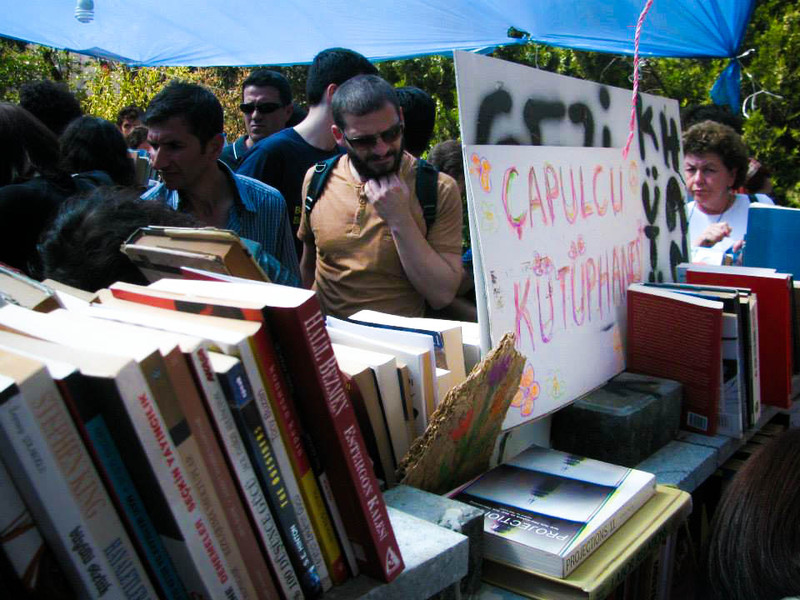 People are scrimmaging around a library called “Çapulcu Kütüphane” constituted out of stones in one corner of the park; (The expression “Çapulcu”, in English: “Marauder”, was formed by Prime Minister Erdoğan, who named the protesters in one of his speeches in that way. Humorously the protest movement accepted this expression and many are saying proudly now: “I am a çapulcu!”). Donations are arriving continuously here as well, from private people to bookshops. The pebbly shelves are fully packed by now and new arriving books are distributed immediately. The atmosphere reminds one of an auction, only no one is demanding money for the things auctioned here. 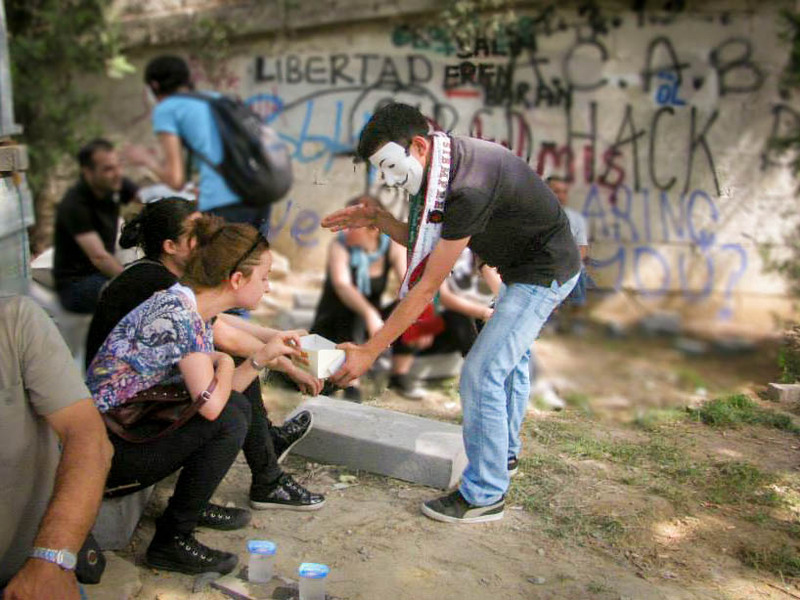 As it is the Muslim holiday “Miraç Kandil” on this Wednesday, alcohol is not appreciated inside the whole park, to demonstrate respect towards Muslim protest participants. And as a matter of facts, I do see alcohol neither during the day nor during night time within the whole area. In favour there are vast numbers of “Kandil Simidi”, little seam-curls, which are especially distributed on this holiday. 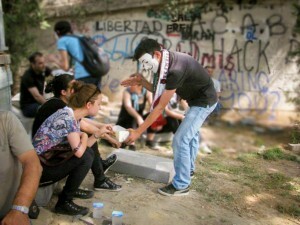 I am observing a teenager, who is swaying a Guy-Fawkes-mask and a soccer-scarf and offering everyone a box of pastries. At some point a toothless smiling, old man is passing me a box with Simit in my hands and points at the mass, therefore I start walking around with a box in my hand as well and distributing the little lusty pastry. The evening approaches and the park is getting crowded. Also more and more Suiters are appearing in the crowd. The atmosphere reminds me of a festival, people are dancing and music is sounding off everywhere, chants like “Faşizme karşı omuz omuza!” (Shoulder to shoulder against fascism!) resound over and over again. I am joining the collective of feminists of a while, dancing a little folklore in a circle, listening to a guitar-concert. Then the park gets too crowded for me, one can only move at a crawl and I am joining a few friends, who are observing the events from the steps of an apartment building at the edge of the park. They all agree on one point: Something like this has never happened in their country before.